By default, comboboxes are only visible when the inplace editing has started. In some situations, it might be helpful that the user can see through the dropdown image that a cell has a combobox. 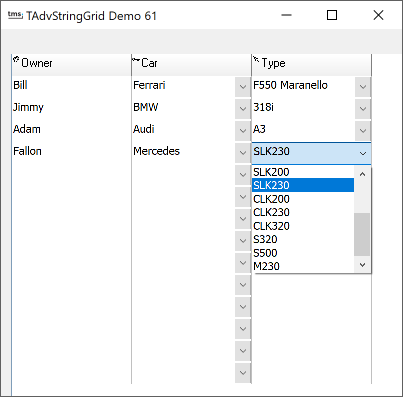 With TAdvStringGrid this is possible by using one property and one event handler. To enable the display of comboboxes for any cell that has a combobox inplace editor whether the cell is in edit mode or not, set grid.ControlLook.DropDownAlwaysVisible = true. Setting this property is not sufficient as an extra event OnHasComboBox is used for more fine grained control. With OnHasComboBox, some comboboxes can be made always visible and some not. Two additional tricks have been used in this sample. To make sure the combobox drops down immediately upon clicking the always visible dropdown button, the property grid.MouseActions.DirectComboDrop was set to true. Finally, to make sure the dropdown in the cell appears immediately in column 2 when a combobox value is selected in column 1, the OnComboChange event is used from where grid.RepaintCell(2,ARow) is called.